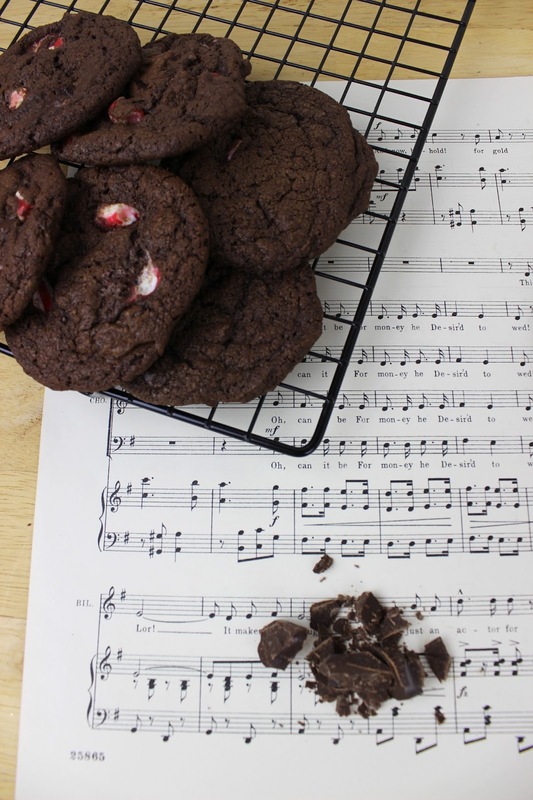 The Little Whisk & Co: Triple Chocolate Peppermint Cookies. Today I am sharing with you a super easy and quick festive cookie that can be made in batches for last minute gifts or holiday treats. Use your left over candy canes from your tree and whip up this rich delicious cookie mixture. It is bursting with triple chocolate; cocoa powder, melted dark chocolate and chopped dark chocolate chunks - plus the addition of roughly chopped peppermint sticks makes these cookies scream with flavour. They are so indulgent with the oozing chocolate once taken from the oven and they will make you be tempted to take a second one. 1. Preheat the oven to 160-degrees and line cookie trays with parchment paper. 2. Place the butter and sugar in a large mixing bowl and beat until light and fluffy. 4. Add the flour, cocoa powder, bicarbonate of soda and melted chocolate, and bet until just combined. 6. Roll tablespoons of the mixture and place onto the prepared cookie tins. 7. Bake for 12-15 minutes and allow to cool on the trays first as they will be extremely soft and delicate - if you try to move them to soon they will collapse and crumble into one. I hope you enjoyed this last minute cookie recipe - it only takes around 15 minutes to prepare and then baking them in stages will take a little while, however it is not a complicated recipe, so enjoy with you family and friends. White Chocolate & Cherry Cookies. Cranberry & White Chocolate Muffins. DIY Christmas Bauble Cake Stand. Chocolate, Cranberry & Macadamia Brownie.